Similar to previous years, let's start with the fancy stats. 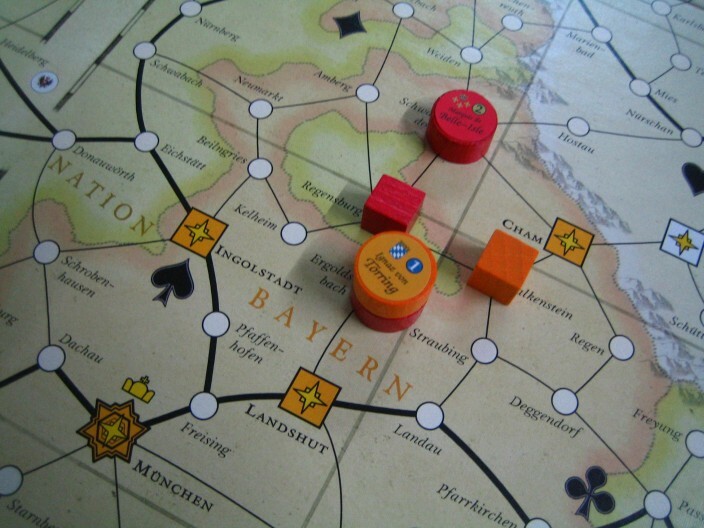 This year, I recorded an additional aspect of my boardgaming - whether a particular game played was a computer version played against AI's. That means I now have some additional stats. The 2011h column means humans-only data. 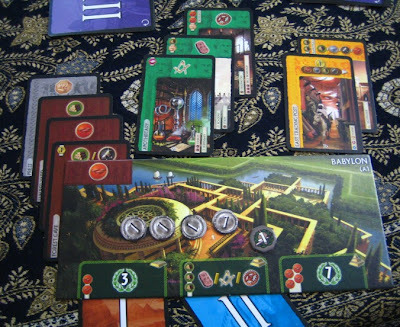 There are some boardgames which I have only played the computer versions of in 2011. Last year I played a crazy number of games of Dominion and Race for the Galaxy against the computer, which explains the drop in the raw numbers this year. 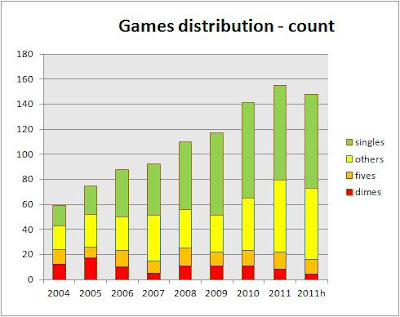 I still played many games of 7 Wonders against the computer, but not as many as those games played last year. All lines use the axis on the left except for Total Plays which uses the right axis. My number of distinct games played continues to rise. Similarly for new to me games. Total plays dropped significantly, but I suspect it is more because of the distortion caused by the 613 vs-computer plays of Dominion and Race for the Galaxy in 2010 than because I have been playing games less in 2011. Same chart, but using the human-only numbers for 2011. This chart shows 2011 and 2011h numbers together, which can be a little confusing. In either case, total distinct games played has increased. This is the percentage view. I'm happy that the yellow section has increased, which means there are more games that I managed to play 2 to 4 times. I've always felt that one needs to play a game a few times to fully appreciate it and enjoy it (unless it's a simple game). This is counting every play. 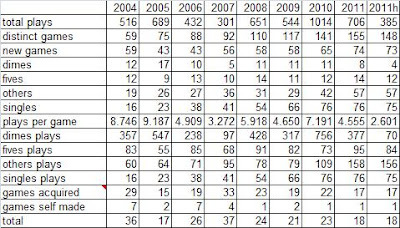 The biggest contributors to the red section for the 2011 bar are 7 Wonders and Brawl. 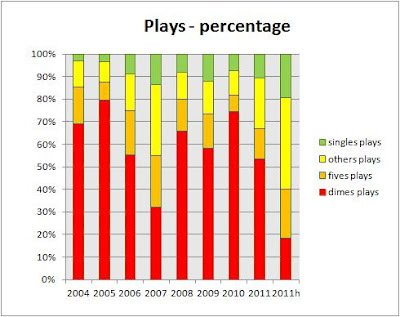 Many of these plays are vs-computer, and that's why the red section of the 2011h bar is much shorter. For the first time in 6 years I managed to acquire no more than 20 games. I am going to set a humble target of 18 in 2012. Numbers in brackets are plays against the computer. 2. Brawl 78(78) It was free on the iPhone, and I'm happy to have discovered this little gem. 3. Race for the Galaxy 38(20) One of my favourite games, and still holding on to a respectable number of plays. I'm looking forward to the next expansion which will be under a new story arc, i.e. cannot be mixed with the previous expansions. 4. Uno 25 A lot of fun with the kids (6 and 4). 6. Halli Galli 16 Played with my children. 8. Innovation 11 I wish I had played more. I like this. 13. At the Gates of Loyang 7 I played this more with my 6-year-old daughter (using simplified rules) than with my wife. 20. The Message: Emissary Crisis 6 6 games (or so) in one game session. Addictive and fun. 40. 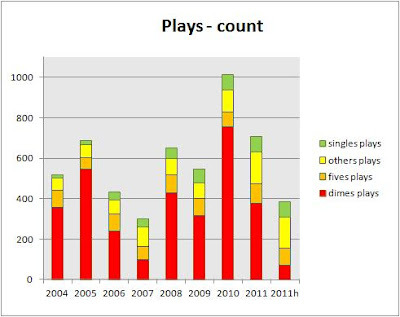 Dominion 3(3) Wow... how far this has fallen since last year (273 plays). 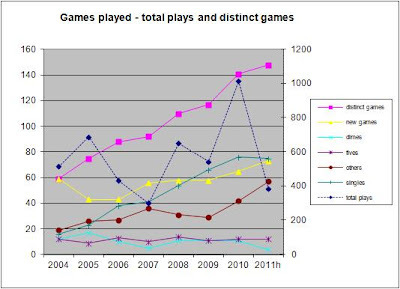 That's a total of 706 plays of 155 unique games. 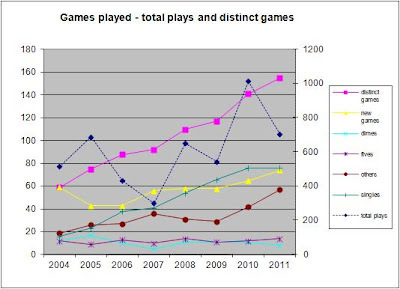 If I exclude the vs-computer games, I have 385 human-only plays, i.e. 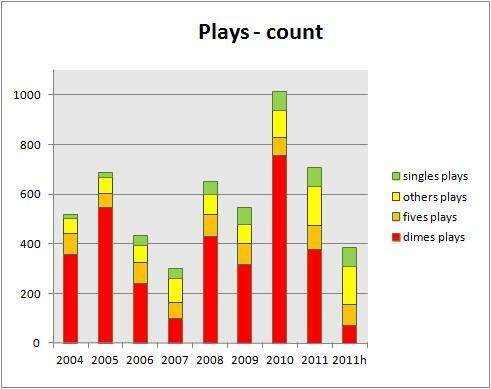 from my total of 706 plays in 2011, 321 were vs-computer plays. There are 7 games which I have only played against the computer in 2011. 18TN - Finally I got to experience an 18XX game. I tend to feel uneasy with stock-holding games, because they feel counter-intuitive to me, but at the moment I am cautiously optimistic about how I will further enjoy 18XX system. 20th Century - I liked Shipyard (same designer), but 20th Century felt so-so. Will I like Last Will? 51st State - I like it well enough, but not enough to replace it with The New Era. Version 1 is good enough for me. 7 Wonders - I like it very much. This is a wide-appeal game, although it may not be a Top 10 game for many. A Few Acres of Snow - Keen to explore more, using the updated rules. Airlines Europe - Stock-holding, so, not really my thing. Antiquity - Crawl out of quicksand while thinking of how to win and doing it faster than your opponents. Planning to get this. Brawl - I prefer this over Jab despite being more abstract, because it feels more fast-and-furious. Dominant Species - I like it but only moderately, because of the area majority aspect. Dungeon Petz - Ordered. I like it more than Dungeon Lords, which I found just okay. 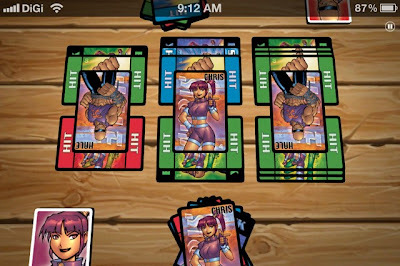 The double-guessing in Dungeon Lords felt more random than I could accept. I feel there is a bit more control in Dungeon Petz. Earth Reborn - Still halfway through the learning scenarios, but so far so good. Rich background story. I just worry about replayability of the scenarios, despite how interesting the stories are. I have not tried scenario building though. Evolution - Simple, fun, thematic card game from Russia. Famiglia - Quite a clever card game that requires some long-term planning and has hard decisions to make. Fast Flowing Forest Fellers - Race games are not my thing. This one is OK.
First Train to Nuremberg - Like, but on the second play it starts feeling less novel. I hope I will be able to get more than a handful of plays from this. Haggis - Climbing card game that works for 2 too. Havoc - Poker with longer term strategy. Too bad this is out-of-print. Here I Stand - Learn one semester's worth of history about the religious reformation in Europe in 9 hours. Love this. Inca Empire - Good game. Beautiful second edition. Indonesian Finger Game - No components. Just use your hands. Wait... that sounds... not quite right. Irondale - Didn't like, felt too tactical / short-term. Jab - More pattern recognition under time pressure than releasing your inner wild animal. K2 - I'm impressed with how thematic this felt. Kingdoms of Crusaders - Lost Cities with less maths. Kingsburg - It seems the interesting-use-of-dice games tend to be misses for me, e.g. Troyes, Macao. But then I like Yspahan and Alien Frontiers. Labyrinth: The War on Terror - It's hard being a terrorist. It's hard being the world's sole superpower too. Leaping Lemmings - Should be light and fun but I didn't find it light and fun. Maori - Appears light but can be challenging when adding all the optional rules. Maria - Tense manoeuvring before battles, and tense battles. Merchants and Marauders - I like a lot. I prefer to increase the target Glory points so that I get a fuller experience, else the game seems to end just when it starts getting interesting. Nightfall - Deck-building game that feels significantly different from Dominion. 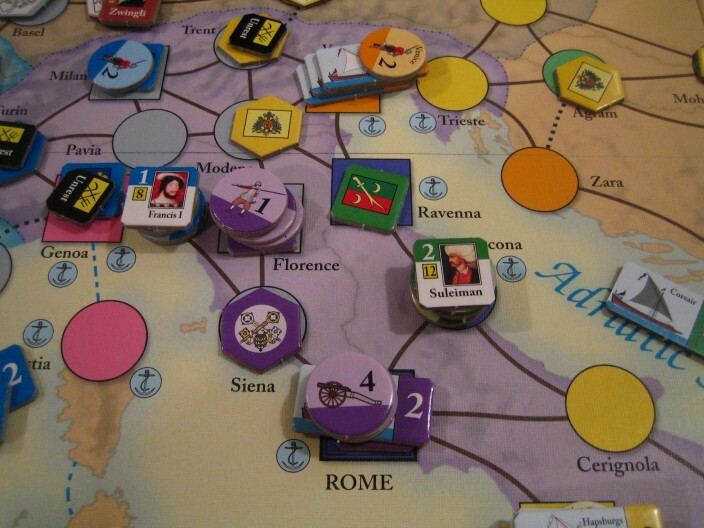 It's a multiplayer conflict game, so diplomacy is important and it is easy to get ganged up upon. Omen: A Reign of War - Good 2P card game with excellent artwork. Pacific Typhoon - Essentially an abstract card game with lots of flavour. Also a negotiation game with shifting alliances. Piece o' Cake - Elegant design. Has one clever mechanism. Minimalistic. Didn't click. Power Grid: The First Sparks - Seems to be more suitable for people who don't like Power Grid. If you already love Power Grid, this feels like a diluted version. Resident Evil - Didn't feel different enough from the elephant in the room (Dominion). Sid Meier's Civilization (Fantasy Flight Games) - I like it, but to me it's a sprint and not a marathon. Successors - Good multiplayer wargame. 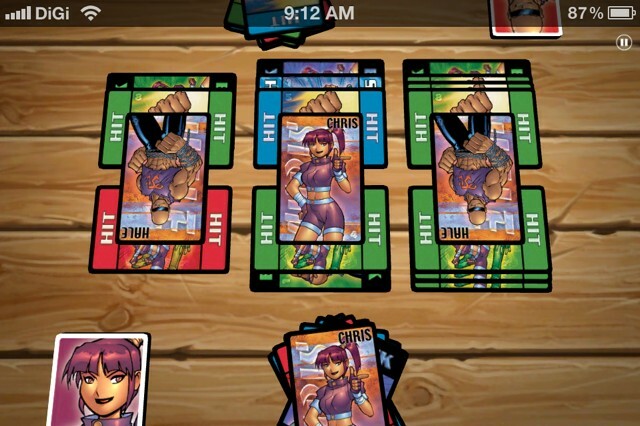 Card driven game. The Adventurers - Excellent production but game didn't click at all. The Message: Emissary Crisis - Great fun with a big group. A pleasant surprise. The English rulebook is poorly written, and needs an English-to-English translation. The Speicherstadt - Didn't like. One clever mechanism does not guarantee a good game. Tikal II - Found it so-so. Feels unfocused. 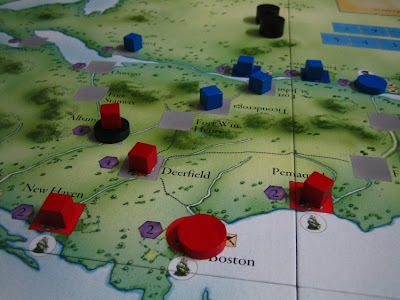 Tinners' Trail - Low granularity (but not simple) Martin Wallace game. Troyes - Some interesting mechanisms, but I didn't find the game captivating. Vikings - A pleasant build-your-own-play-area game. Wars of the Roses - It has double-guessing and area majority, both of which I usually don't quite like, but I like this game. I like how loyalty and betrayals of your subjects are implemented. 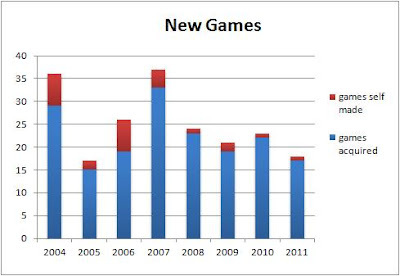 Finally, in 2011 I was able to not exceed my self-imposed quota of 20 new games per year. I was only up to 18. If I twist my definitions, the number will be even smaller. The Kids of Carcassonne - The first three are for the children, not for me. The Message: Emissary Crisis - These are review copies or gifts. Agricola: Gamer's Deck - These are expansions of games I already like. 51st State - These are surprise findings, discovered due to Han and Allen respectively buying them. Endeavor - These are try-before-buys. Maori - These were added to my collection after doing research and knowing what to expect. Haggis - I self-made a copy using regular playing cards. This self-made copy only have four suits, so it can only be used for 2-player games. 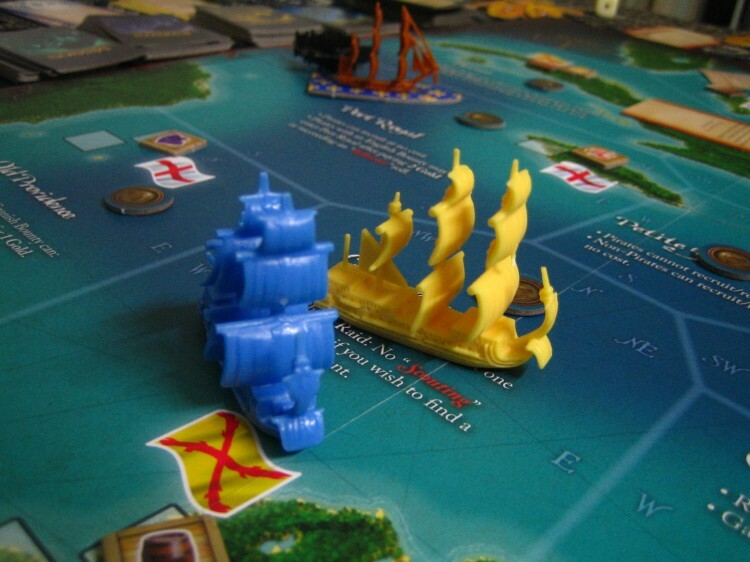 The original game supports 2 to 3 players. Favourite new-to-me-in-2011 games: The only one I'm sure about is Merchants & Marauders. Tentative ones are Antiquity, A Few Acres of Snow and Here I Stand, which need more play before I can really be sure. Getting Here I Stand to the table won't be easy though. Other games that I quite like: Sid Meier's Civilization, K2, 18TV, 51st State, 7 Wonders, Dungeon Petz, Earth Reborn, Famiglia, Evolution, Haggis, First Train to Nuremberg, Maori, Maria, Successors, The Message: Emissary Crisis, War of the Roses. Wow... 16 of them. Pleasant surprises: Famiglia, Brawl, Omen: A Reign of War, The Message: Emissary Crisis, Vikings. Some favourites that I regret not playing in 2011: Princes of Florence, Die Macher, Lord of the Rings, Axis & Allies games. 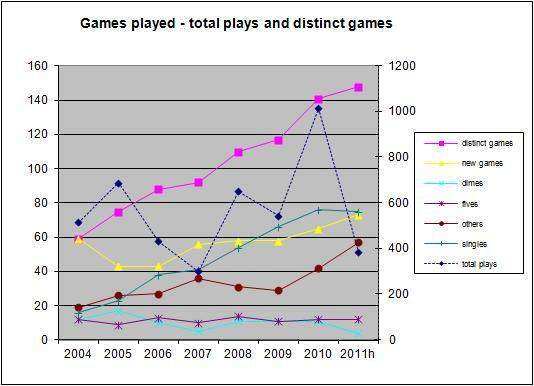 In 2011, my wife Michelle had 149 plays, 48 distinct games. 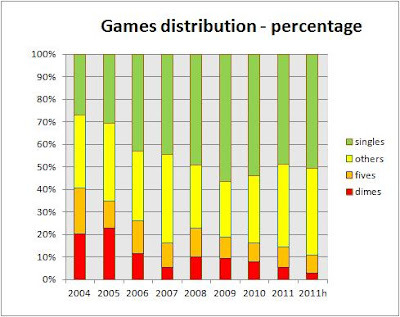 Most played games are Uno (30), Race for the Galaxy (18), Power Grid (8). Older daughter Shee Yun (6 years old) had 126 plays, 31 distinct games, most played games are Uno (30), Halli Galli (16), Spot It (8). 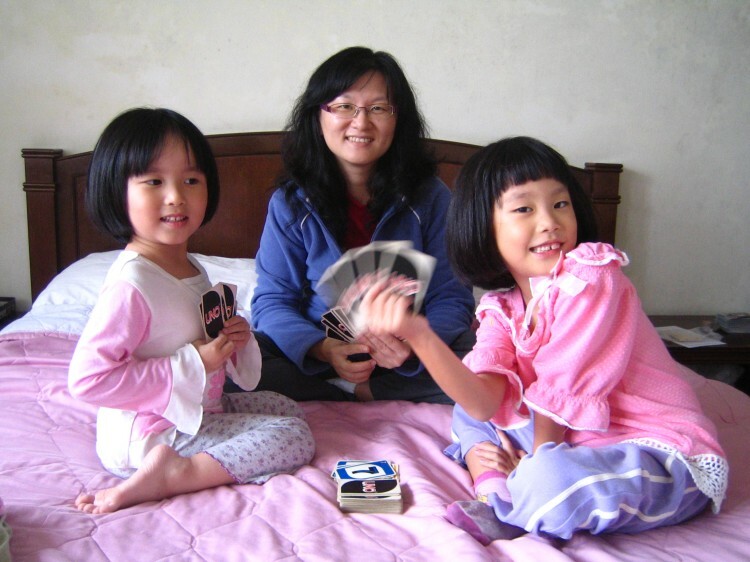 Younger daughter Chen Rui (5 years old) had 84 plays, 28 distinct games, most played games are Uno (27), Halli Galli (7), Ubongo (5). From the numbers, it looks like we all love Uno. Han, Allen and I have more or less settled into a comfortable routine in organising game sessions. Most often it's just the three of us playing. One thing that I feel we have been doing well is doing repeat plays, which allowed us to gain more insight in these games, and allowed us to appreciate them more. E.g. plays of Sid Meier's Civilization, Merchants & Marauders, Dominant Species, Maria. I realised how I got to know my friends (and myself) better through boardgames. Jeff of Boardgamecafe.net has a new location for his more-or-less regular open gaming sessions on Friday nights. Memorable sessions there include plays of 18TN and Antiquity. 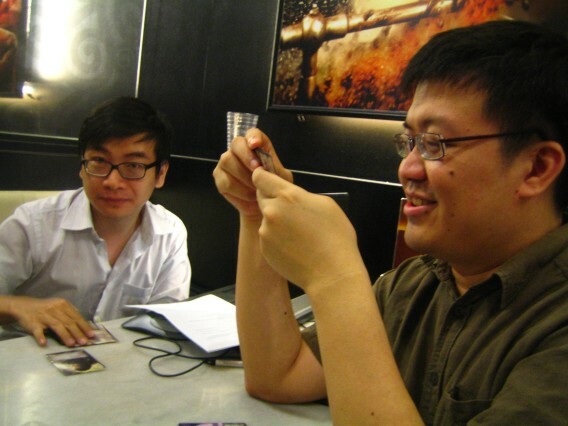 OTK in Cheras, Kuala Lumpur. Here I Stand was certainly another memorable session, and also The Message: Emissary Crisis. I managed to bring an old favourite back to the table - Samurai Swords (latest version is called Ikusa). 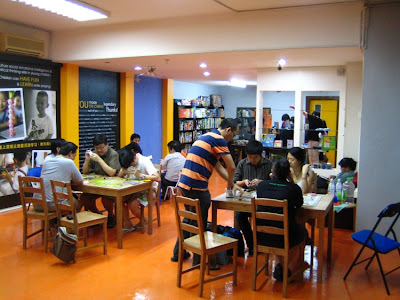 I thought Witch House, the boardgame cafe in Taipei where I started my boardgame hobby in 2003, was going to close down, but they eventually managed to stay open. I was in the media, interviewed by The Star newspaper, and also in an awkward way, in a series of videos. This blog was blocked at my work place. 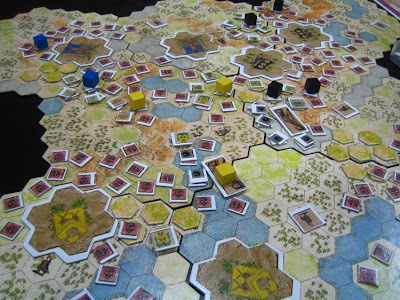 I have been maintaining dual boardgame blogs for more than a year now, my Chinese blog being started in Dec 2010. It has been demanding. The toughest moments are always when I have completed a post for one blog, and have to steel myself to start writing the same post for the other blog. It feels like dreaming about waking up, brushing your teeth, changing, eating breakfast and driving to work, only to then really wake up and discover you have to do all that all over again. Yet, it has been fulfilling, and I hope I can continue this. 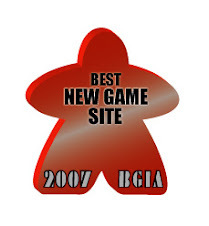 I don't have many big achievements in 2011 in terms of gaming or blogging about it. I'm just happy that I have good games to play, and good friends to play them with. Keep up the fun and good work! Wow, that's lot of played games. I enjoy your blog quite a bit and look forward to more in 2012. Thank you Jason, Sue, I too look forward to continued gaming and blogging in 2012!